This cake was a white cake with a fresh raspberry filling and iced with vanilla American buttercream. The Eiffel towers were made of chocolate and white chocolate, and the flowers were fondant. There were black sugar pearls, white sugar pearls, and hand piped black icing. 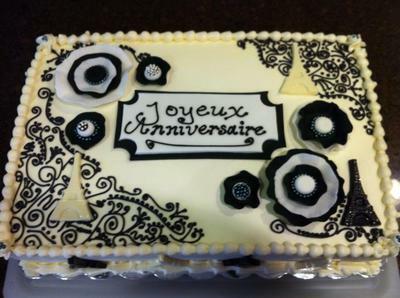 It was a birthday cake for a friend who wanted a French theme in black and white, with a graphic feel to it.